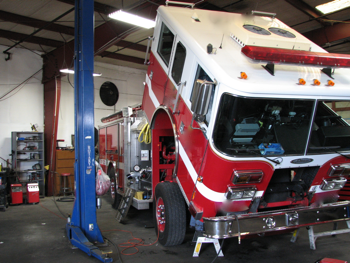 Diego Truck Repair offers a complete service and maintenance facility. We have light, medium and heavy duty truck specialists that are factory trained technicians to work on Cat, Cummins, Detriot, IHC and more. We do it all – B.I.T. Inspections to comply with CHP regulations and federal inspections, custom fabrication and welding, overhaul or complete replacement. We offer extended hours to better service commercial accounts. Our shop is right off highway 101 and easy to access. Our friendly staff can answer any questions you may have. Unable to get your truck to the shop? Not a problem. We have medium and heavy duty tow trucks and a landoll to get your vehicle in for repair. Or we can come on site with our fully equipped mobile mechanic service truck. Light, medium and heavy duty truck specialists. Complete service and maintenance facility. B.I.T. Inspection service to comply with CHP regulations and federal inspections (at your facility or our show). From Individular to fleet and commercial service programs. Brake services, Air and hydraulic systems. Suspension and Springs, Repair,replacement or modifications. Frame and Chassis-Wheelbase changes and repairs. Electrical Components-Alternators, starters and batteries, minor short repair to complete truck rewiring. Gasoline and Diesel Engine Repairs, Factory trained technicians on Cat,Cummins, Detroit and IHC. Overhaul or complete replacement. Transmission and Differential repairs, Clutch replacement and Allison Automatic Service. Extended business hours to better serve commercial accounts. 24-hour Towing -Medium and heavy duty. 3 Trucks available for local and long distance service.